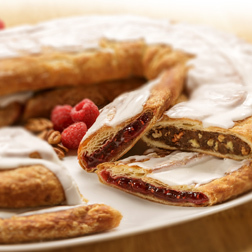 The original Kringle from way back when! 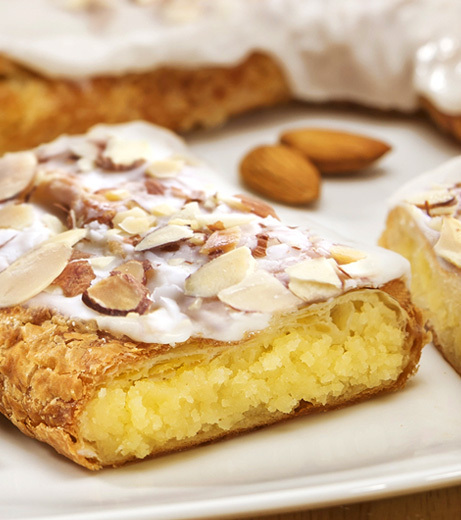 Our Almond Kringle is one of our best-selling Kringles, year after year! 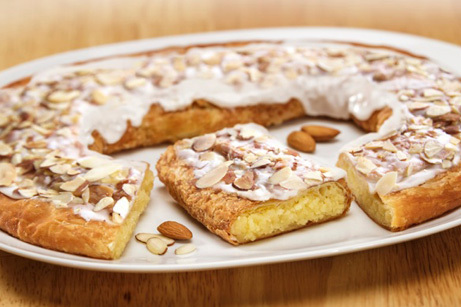 In addition to its buttery rich pastry, it's topped with a smooth vanilla icing and toasted sliced almonds for a little nutty crunch. Contains Egg, Milk, Soy, Wheat, Almond. May contain traces of tree nuts (macadamia nuts, pecans, walnuts) and peanuts due to processing on shared equipment. Sugar, Margarine (Interesterified Soybean Oil, Water, Salt, Mono- and Diglycerides, Colored with Annatto/Turmeric. Calcium Disodium EDTA preservative. Artificial Butter Flavor. Vitamin A Palmitate added. ), Wheat Flour, Eggs, Apricot Kernels, Almonds Contains Less Than 2 % Of Each Of The Following: Salt, Soy Protein, Yeast, Corn Syrup, Dextrose, Corn Starch, Calcium Carbonate, Maltodextrin, Tocopherols Preservative, Calcium Propionate Preservative, Agar-Agar, Natural And Artificial Flavors, Malted Barley, Soy Lecithin, Potassium Sorbate Preservative, Xanthan & Guar Gums, Color Added.